The South House School for Girls was a short-lived private school during the 1890s. It was located at 19 South Street, and was run by sisters Esther and Edith Groom. There is only one advertisement for the school, placed in the 1894 edition of Whitby's Yeovil Almanack Advertiser. The sisters were two of the eleven children of affluent colonial broker William Samuel Groom (1814-1878) and Esther Dean née Linley (1832-1899). The eldest of the Groom children, Esther Greci Talbot Groom, was born in 1854 in Camberwell, Surrey, and Edith, the ninth child, was born in 1865 at Swanscombe, Kent. Esther and Edith came to Yeovil in the late 1880s or very early 1890s and established a small girls' school, called the South House School for Girls, in South Street, close to the junction with the Triangle. In the 1891 census 37-year old Esther and 26-year old Edith were listed at 19 South Street (close to the Triangle - see Gallery). Esther gave her occupation as a teacher and Edith gave hers as an assistant. Living with them were two pupils, sisters Mary and Martha Dowding, aged 13 and 12 respectively. An advertisement of 1893 for the school stated "Educational Home in the Country for Girls; Inclusive terms £18 per annum; examinations; unlimited diet; thorough care and training; healthy neighbourhood." No advertisement for the school appeared after September 1894, and no further trace could be found of the Misses Groom. An advertisement for the South House School placed in the 22 September 1893 edition of the Bromley & District Times. The description of the school is interesting. An advertisement for the South House School placed in the 20 April 1894 edition of the Western Gazette. An advertisement for the South House School for Girls in the 1894 edition of Whitby's Yeovil Almanack Advertiser. The eastern end of South Street, seen from the Triangle. Detail from a postcard sent in 1914. 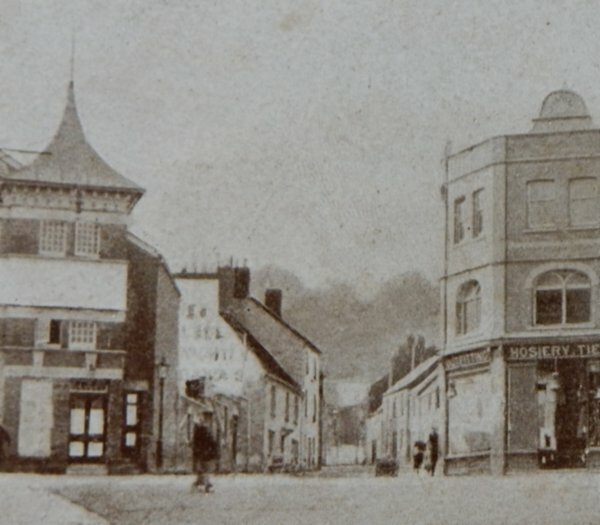 From its location in the 1891 census, the three-storey building at the very centre of the photograph is likely to have been the location of the South House School for Girls. The last advertisement for the South House School for Girls, from the 4 September 1894 edition of the Bristol Mercury.